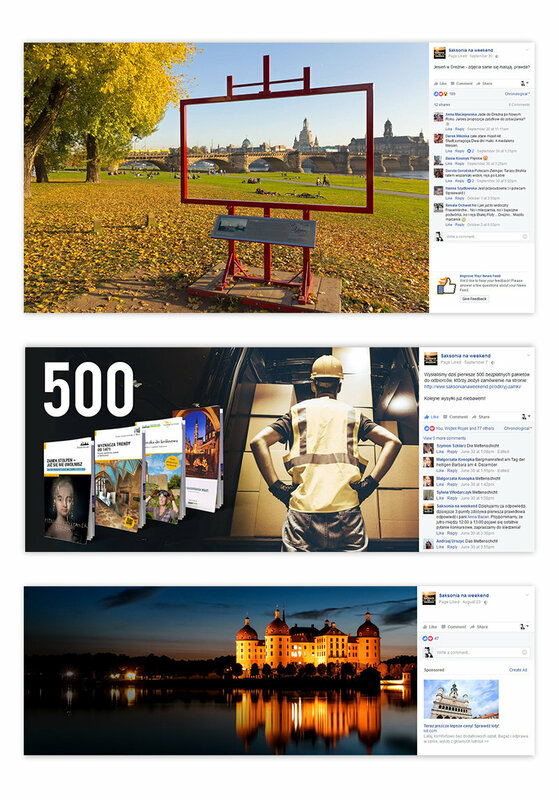 We conducted a nationwide digital campaign promoting Saxony on the Polish market. We are responsible for strategy, design, production, audience engaging throughout the online and offline channels. 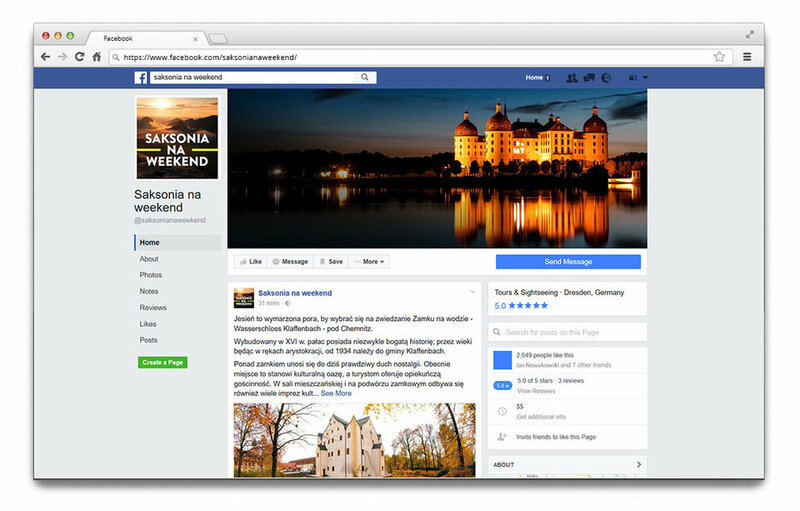 We are running an official fan page „Weekend in Saxony", we have developed a number of dedicated landing pages, we run contests, work with blog influencers. We also connect offline and online worlds - we mail thousands of high quality printed catalogues to travel fans all over the country. Oh, and one more thing - we deliver great results! We were lucky to get the order from TMGS Saxony and start a promotional campaign aiming at familiarizing Polish tourists with Saxony’s potential. Examples of the website campaigns on the polish market. Weekend in Saxony Facebook page. Not only is the region abundant in different kinds of cultural and landscape attractions (there is something for everyone! ), but also it is located within hand’s reach, right across the Polish border! Great idea for an extended weekend or a vacation trip. It appears that the region is friendly to singles, as well as families with children. Unique and romantic atmosphere of Saxonian cities also favors those in love and people who would like to feel a prickle of excitement. Saxony is a global collage of Caspar David Friedrich paintings and modernity of Wes Anderson films. 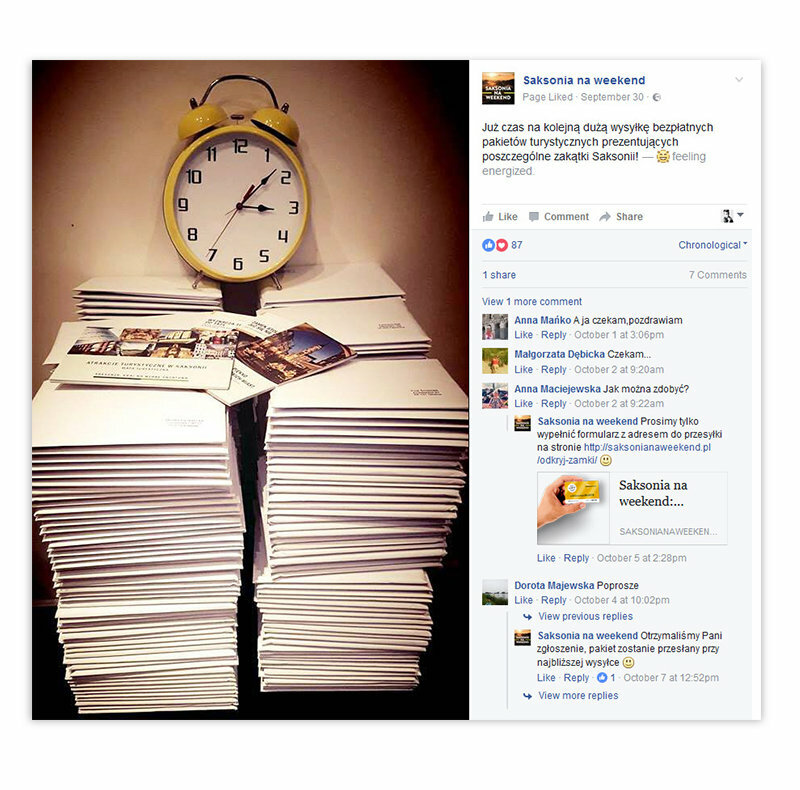 Our fans were crazy about offline packages which consisted maps, catalogues and more! We focused on omnichannel campaign with main Saxony on Weekend website as a base of our strategy. At the same time we conducted increased actions in social media (Facebook, AdWords and Instagram media boost). One of the aspects of the campaign were assembled traffic on page with form for shipping Saxony’ free travel packages with the most attractive tourist advices. During this campaign we mailed 2383 boxes. 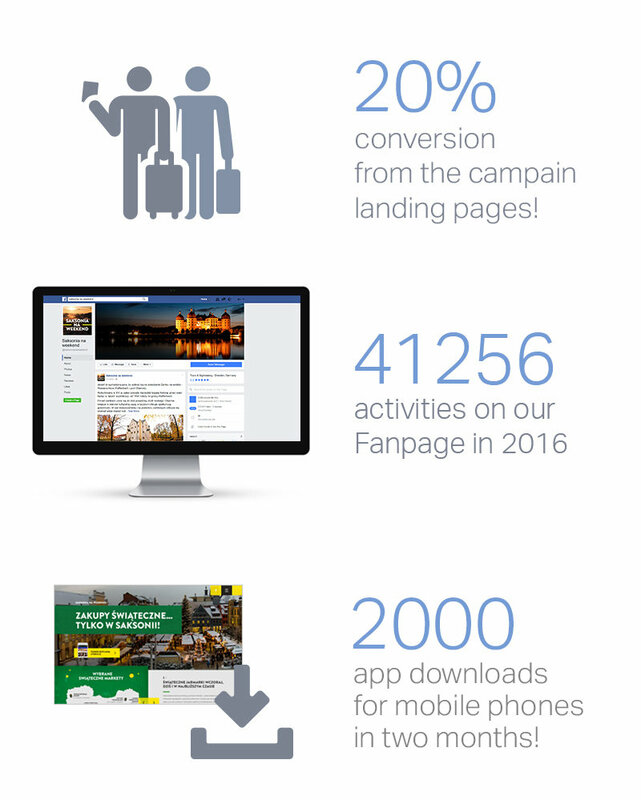 Through out the year some of our Facebook posts met higher interest of our fans. More than 41000 activities were generated by them in 2016. As a part of our promotional activities we run an official fan page „Weekend in Saxony”, where we present the highlights of Saxony’s appeal and beauty. In the nearest future we are going to run a few nation wide digital campaigns. There will be attractive prizes for winners of our contests – a hotel stay, among others – it’s worth to be up to date! See seasonal campaigns: Weekend in Saxony website, Saxony' castles site, Christmas in Saxony page and Facebook profile of Saxony.